NOTICE: This is the strand of 48ft string, bulbs are not included. Please search ASIN: B01LXSDBRE for S14 11-watt warm white bulbs if needed. SHINE HAI String Light is ideal light for adding a comfortable atmosphere, give an inviting warm incandescent glow that will bring any room or party to life. 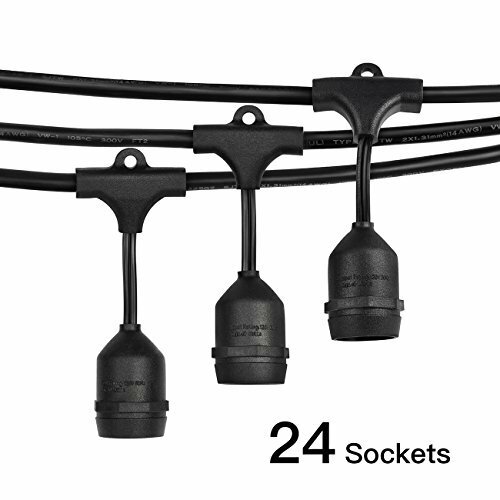 BEST REPLACEMENT STRAND - 48Ft black rubber WEATHERPROOF cord contains 24 light sockets (others only 15) set about 2 feet apart. Heavy-duty rubber construction throughout the molded sockets & integrated hanging loops. End-to-end connections, feel free to customize your arrangements. WIDE APPLICATION - Ideal for all outdoor applications, backyard, terrace, gazebo, patio, or contemporary cabana. Best decoration for an outdoor party, anniversaries, weddings, holiday celebrations, and many other occasions. VARIATY CHOICE - This strand without bulbs will accept any E26 medium base bulb, incandescent or LED. For incandescent we recommend 11 watt bulbs while for LED is 1 or 2 watt bulbs. INTIMATE CUSTOMER SERVICE - SHINE HAI stands behind all of our products 100%. Please contact us directly you are not completely satisfied with your purchase, please don't hesitate to contact us, we'll get it resolved as soon as we can.